Natural News readers may recall that I sounded the alarm on lead and aluminum in "micronized" zeolite powders, encouraging people to stop taking zeolite powders and see if they feel better. In response, I was threatened with legal action by a zeolite powder manufacturer. I was also contacted by another zeolite developer who created what he called "hydrolyzed" zeolite, explaining this his zeolite was water soluble and very, very clean. Although I was initially quite skeptical of this claim, I conducted a detailed interview with him. Hear my full interview with Clayton Thomas at this podcast link at HealthRangerReport.com (my podcasts are also now available on iTunes). Clayton sent me his CytoDetox product for testing, inviting me to analyze it in our forensic food laboratory which can detect elemental composition at parts per billion concentration. CytoDetox is found at CleanLiquidZeolite.com. This link, by the way, forwards to another domain that carries the product and appears to have an affiliate link. This is NOT our affiliate link. We have no financial involvement whatsoever with this product, and we receive no compensation from its sales. CytoDetox is sold through physicians only, and the link shown here is tied to a particular physician. For questions on acquiring Cyto Detox, email [email protected]. It's also important to note that we did not charge the CytoDetox company for these lab tests. We conducted our lab tests at no cost to the manufacturer, and we are releasing them at no cost to the consumer (see results below). NOTE: Normally I prefer to acquire products myself so that I can establish the chain of custody from a retail shelf to my lab. Receiving samples directly from manufacturers invites the possibility that they might submit a "clean" sample to me even while selling less clean product into the marketplace. Nevertheless, I'm publishing these results on CytoDetox as a preliminary announcement in the public interest, inviting other labs to also test this product and see if they get the same results I did. My intention is to purchase this product off the shelf at a later date and test it again, making sure the results are substantially equivalent to what I'm seeing here. Compare this to some of the powdered zeolite material I tested, which showed lead of 20 - 50 ppm (in other words, 20,000 to 50,000 ppb) and aluminum of over 30,000 ppm (in other words, 30,000,000+ ppb). How can a liquid zeolite product have such low heavy metals compared to powdered zeolites? One answer is that the hydrolyzed zeolite in this product is substantially diluted; In each 0.5 mL serving, there is only 0.5 mg of zeolite material. The liquid, in other words, is largely made of clean water... and this isn't a bad thing at all, especially if the zeolite is soluble as explained by Clayton Thomas. Even with the dilution, if the zeolite material being placed into these bottles was made from the same zeolite powder I've been testing, my lab instruments would have had no problem detecting somewhere from 20 - 50 ppb of lead, even if the liquid is a dilution of 1000:1 compared to the zeolite solids. Yet our analysis showed zero lead. Not even one ppb. Interestingly, in this very same run on our ICP-MS instrument (Agilent 7700x), the next sample of a different product showed 25,632 ppb of lead. This was a mystery sample sent to me by another person who was testing my lab results. He actually sent two samples, saying one was a mineral mined out of the ground, and another one was a mineral derived from ocean water. He wanted me to tell him which was which. It was a no-brainer. The "mystery" mineral mined out of the ground showed 25,632 ppb of lead while the mineral derived from sea water showed only 26 ppb of lead. At the same time, the magnesium count on the seawater sample was through the roof: 8.9 x 10^7 ppb, which was far outside the calibration range I had set for magnesium (although this Agilent instrumentation does a fantastic job of extrapolation). In any case, my point here is that the CytoDetox liquid we tested really is ZERO lead, because all the other samples I tested in the same run showed accuracy, consistent lead numbers (plus our mid-range calibration check on lead was right on the mark). Our lead detection capability, in other words, is very, very accurate. My conclusion is all this is simple: The liquid sent to me in these CytoDetox bottles contains no lead at all... and very little aluminum. If this is, indeed, a zeolite-based liquid supplement, it appears to be a true breakthrough in clean zeolites. My primary concern with zeolites, by the way, has never been with the zeolite material itself but rather the lead and aluminum released by pulverized zeolites. As I told Clayton Thomas during our interview, if I could find a super clean zeolite that contained no harmful metals or substances, I would be quite enthusiastic about it. 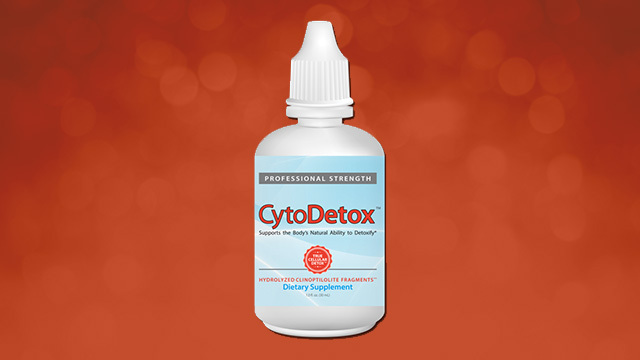 Is CytoDetox that product? As a food research scientist, I can't yet conclude that with 100% certainty (because I haven't yet tested an off-the-shelf version of it), but these early results are very promising. I'd like to acquire this product off the shelf and test that, and I'd like to run three passes on the same substance to get a better average of sample composition. Simultaneously, I have a professional obligation to take into consideration the possibility -- however remote -- that Clayton Thomas sent me bottles filled with nothing but filtered water labeled as "CytoDetox." Although I very much doubt this is the case, until I acquire this product myself -- and can confirm the chain of custody from retail to lab -- I'm not yet ready to say that ALL CytoDetox bottles are as clean as the one I tested. This stance comes from the principle of scientific integrity. If I didn't acquire the product from retail, I can't 100% vouch for it. Nevertheless, I'm optimistic that CytoDetox may indeed be the zeolite breakthrough I've been hoping to find. If it stands up to additional scrutiny, this may be a zeolite product I could vouch for from a laboratory analysis point of view. I'll keep you posted as I learn more. In the meantime, learn more about CytoDetox at CleanLiquidZeolite.com.